Why I have a minicrush on HOOPP? It was orientation day at Runnymede Healthcare Centre and no one knew each other. Everyone was excited and nervous. Some were a little shy than others but most were friendly enough to introduce themselves to each other. I vividly remember when the Human Resources representative asked if any of us heard about HOOPP. None of us raised our hand. I did a quick google search on my phone and found out HOOPP is a defined benefit pension plan. Now, I was not aware about HOOPP but I knew how foolish it would be on my part not to enroll in a defined benefit pension plan. I politely asked the HR rep to sign me up for the plan. I had to sign a form and hand it back to the HR rep. A couple of my new friends opted out of the plan. I started to scratch my head vigorously without trying to get their attention. I failed. One of them suggested me to use head and shoulders. She said it with a straight face. I giggled at her and she told me to stop giggling like a kid. Millions of working Canadians do not have a pension plan at work. In fact, nearly 1.3 million workers in Ontario do not have access to any type of employer-sponsored workplace pension. If you fall in that category, I just shed a tear for you. You are going to be fully responsible for your own retirement savings. Sure, you will get some money from the government when you retire but oh boy, I am concerned for you as that will not be enough. Unless, you live a frugal life like me. Of course, there are exceptions. If you are a teacher in Canada, good for you. If you have a government pension, you should be okay too. But, what about Canadians who work in the private sector like me? Most of the private-sector employees who do have a pension plan contribute to defined contribution plans where employers contribute to match workers’ contributions and then, take zero responsibility. How could they? In contrast, defined benefit plans pay a monthly amount for life. Let me say that one more time – For Life. You will not outlive your pension. Once you start receiving your pension, it will be paid for the rest of your life. Where can private-sector employees find a pension plan that pays monthly amount for LIFE? Insert HOOPP. For starters, HOOPP stands for Healthcare of Ontario Pension Plan. HOOPP is one of Canada’s largest and most respected defined benefit pension plans. Also, HOOPP is Ontario’s third-largest pension fund and boasts about its 309,000 members across Ontario, with nurses being the largest membership group. Other members include physiotherapists, speech therapists, dietitians, social workers and any workers employed by participating HOOPP employers. I asked the dietitians on my floor (second floor) to make sure if they are members of HOOPP and they politely answered by saying yup with a smile. They thought it was a weird, random question for me to ask but I left them in suspense and just walked away. Please forgive me if you are reading this. To be fair, I have been told multiple times that I am weird. 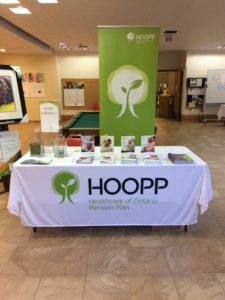 HOOPP is offered by more than more than 490 participating employers across the province, including hospitals, family health teams, community health centres, and other healthcare organizations. This brings me to the first of many benefits HOOPP offers – when you change jobs, you may not have to change pension plans. I called the HOOPP toll-free number to confirm and the staff cordially answered my question. When you change jobs, just let the HR department of your new job know and you should be good to go by filling in some paperwork. How much do you and your employer contribute? You contribute to the HOOPP fund every paycheque. Obviously, the amount you contribute to HOOPP is based on how much you earn and the Plan’s contribution rates. Warning: There are some numbers and calculations involved so I do not want to throw you off. If you are a nerd like me, look at the numbers in awe. If not, feel free to skip the next paragraph. I do want to make a plea though. I was not a numbers person as well but with some effort, you too can understand these calculations. I firmly believe this little effort will help you in the longer run while making major financial decisions in your life. So, yes make an effort to understand these next few calculations. Heck, google the terms if necessary. There is no better time to improve your financial literacy. Now, if you just gave me the finger after reading the last few sentences, I get it. T_T (This is the internet slang for crying). Just know that for every $1 that you contribute, your employer currently contributes $1.26 to the HOOPP Fund. The contribution rate is lower on earnings up to the YMPE to reflect that you also make contributions to the Canada Pension Plan on these earnings. Sally contributes $ 4,257.30 to HOOPP – and her employer contributes $ 5,364.20 on Sally’s behalf. *Sally’s annualized earnings of $60,000 were $5,100 above the 2016 YMPE of $54,900. Okay, done. Pinky promise, no more calculations. Another reason I am profoundly in love with HOOPP is the member’s pension is secure. The monthly pension you receive in retirement will have no effect with the financial markets. No body on Earth or Mars can predict the market. It can crash anytime. Some are brave enough to say he or she can predict the market. I flatly disagree. Don’t let the wolfs of Wall Street and our own, Bay Street devour you. As a HOOPP member, you can sleep in peace knowing that your pension is safe and secure regardless of market fluctuation. Previous Post Are Canadians spending enough time planning for their mortgage? Let’s find out. Next Post Shopping ban for a year? I am in.